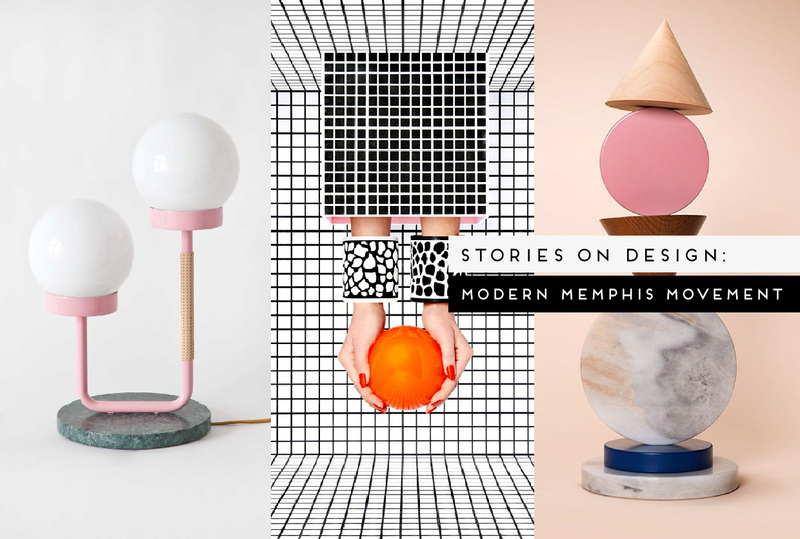 Stories on Design // Modern Memphis Movement. I will tell you nothing new by proclaiming that Memphis is back. No sir. You all would’ve seen it happening in the last couple of years, but things have really come to a head in the last year, with no signs of it slowing down. Call it the 80s revival (I shudder) if you like – Modern Memphis is back with a vengeance, except this time it comes in varying nuances and often in a slightly more sophisticated version of itself. While this post isn’t supposed to be a lesson in history, I think that a little bit of context might be a good thing. Memphis movement was originally initiated by in the 80s, who gathered a group of fellow designers with a vision to start a revolution against the sober and functional ear of modernist design. Serendipitously, the group was named after a , which was playing in the background the day the group was formed. The -based went on to develop one of the most recognisable styles of the late 20th century, converging the influences of Art Deco, Pop Art, Pop Culture and 50’s Kitsch. 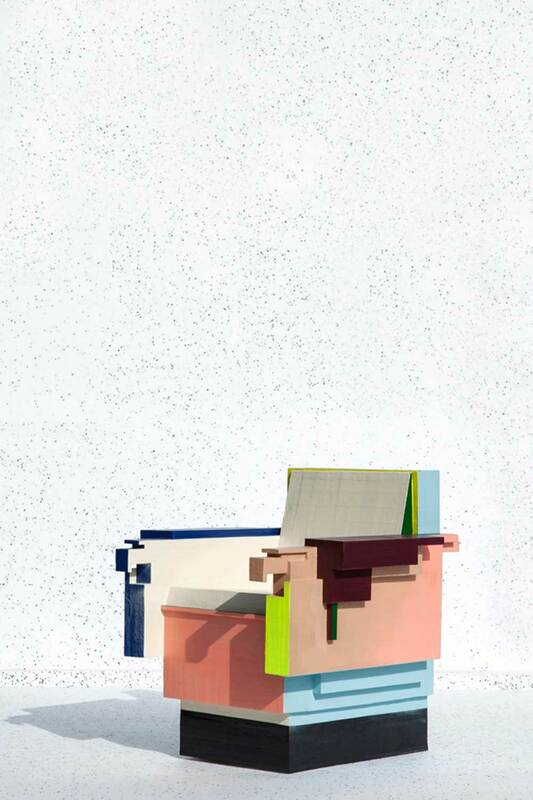 Sottsass’ iconic was one of the first pieces presented in 1981, becoming Memphis’ unofficial poster-girl. 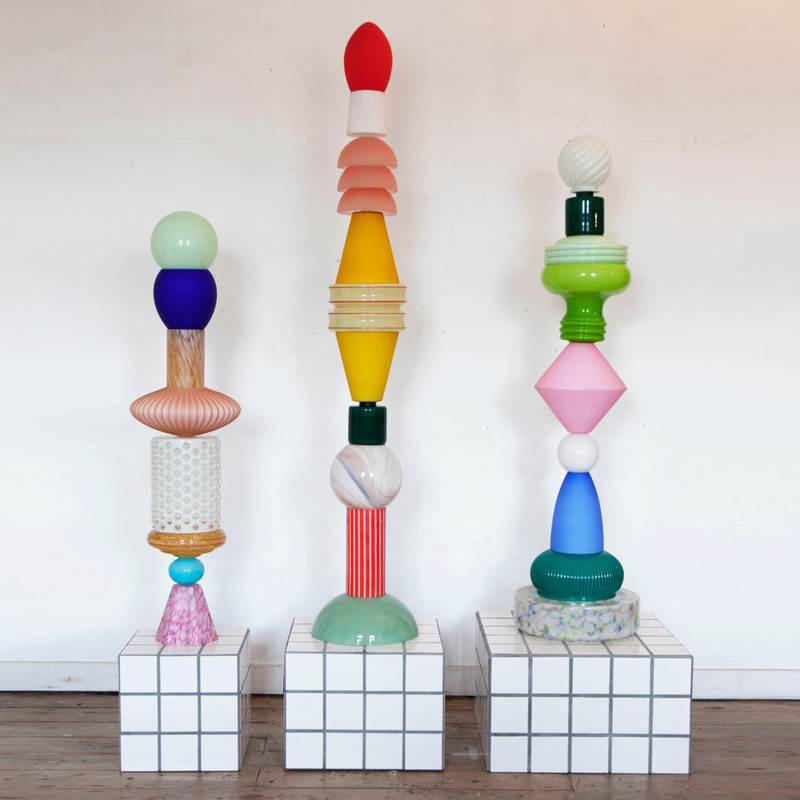 Recently, the Modern Memphis Movement has re-emerged, thanks to a new crop of young designers and makers. Unlike the original movement, the current version is unorganised and much less cohesive, randomly manifesting in the work of designers from all over the world. I would suggest that the key difference today is that, unlike in the 80s, we now have the Internet, where designers are influencing each-other in very different ways. I have to say, I have personally struggled with the Memphis movement, the old and the new, and often find myself having mixed feelings about it’s aesthetic. Part of me is elated, part of me is repulsed by it. But what I do love about it wholeheartedly is what it stands for – irreverence, experimentation, nonconformism, total rule-breaking and a certain kind of freedom that drives progress and innovation. And that can only be a good thing. A very good thing. 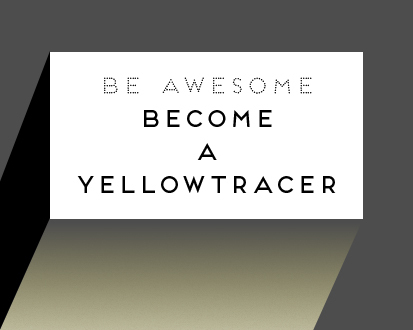 Here are some noteworthy examples for you to explore. 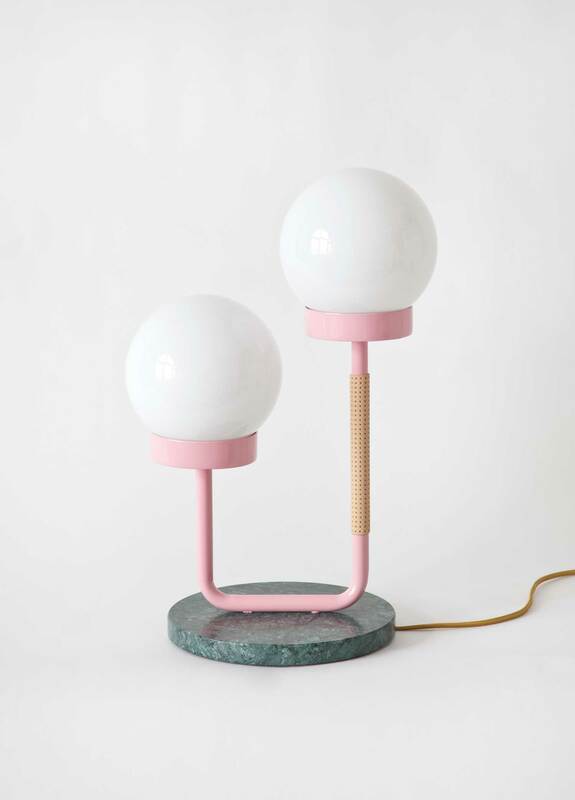 Shape Up Lighting by Ladies & Gentlemen Studio // The Seattle-based design studio, known for unexpected assemblages of simple shapes in pastel tones and polished metallics. 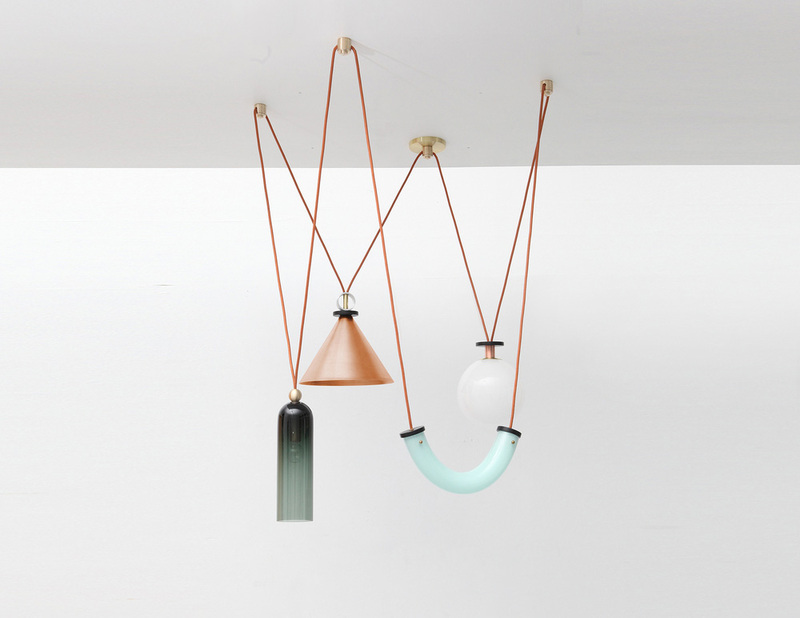 Ladies & Gentlemen collaborated with glass artist John Hogan on its ‘Shape Up’ light collection, which debuted at the 2014 . Forward/Slash by Ladies & Gentlemen Studio // Forward/Slash’s sun-dial inspired form reduces the parts of a task lamp into three basic geometries: the base, the fulcrum, and the light source. 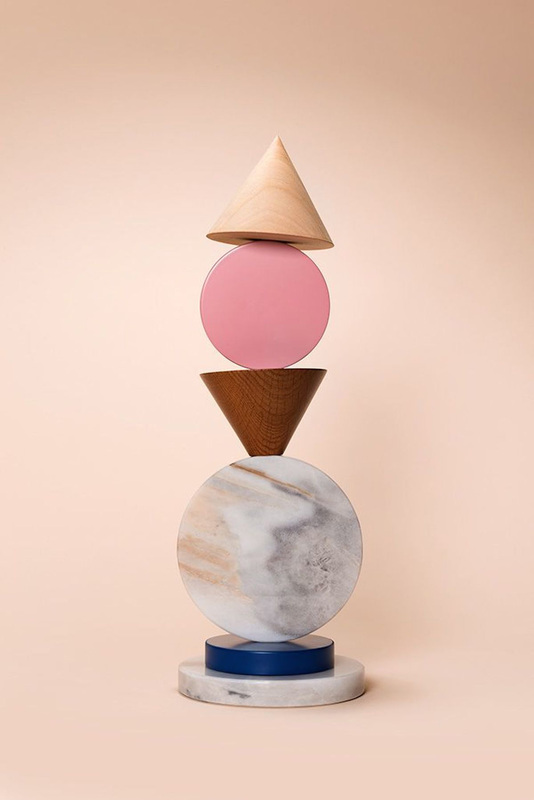 The result is a sculptural interpretation of which function isn’t apparent at first sight. 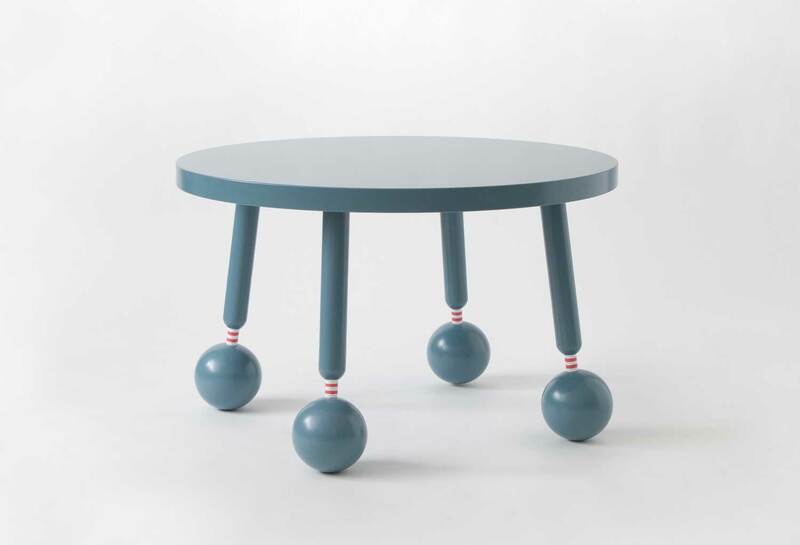 ‘My socks table’ by Swedish Ninja. 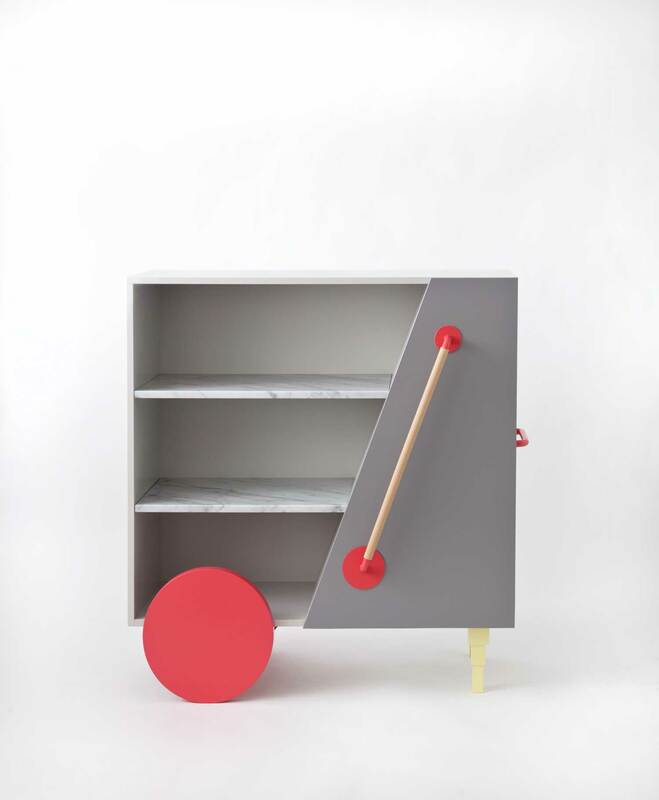 ‘Tula Blomma Cabinet’ by Swedish Ninja. Chaotic Love Collection by Swedish Ninja // The story behind the work of Maria Gustavssson aka absolutely stole my heart. Her collection, titled ‘Chaotic Love’, is inspired by daily life and the realities of motherhood. The two cabinets, ‘Rufus Walter’ & ‘Tula Blomma’ (shown), are named after her two children – each designed to reflect their vastly different personalities. ‘Little Darling’ table lamp celebrates the height difference between herself and her husband – “The height difference between us is striking, but man we are a great team!” ‘My Socks’ coffee table was perhaps my favourite story of the day at Salone Satellite 2014 – “The kids grow so fast, their trousers are always too short, showing their beautiful ankles and little socks”, much like the detail of Gustavssson’s ‘My Socks’ coffee table base. Totes adorbs! 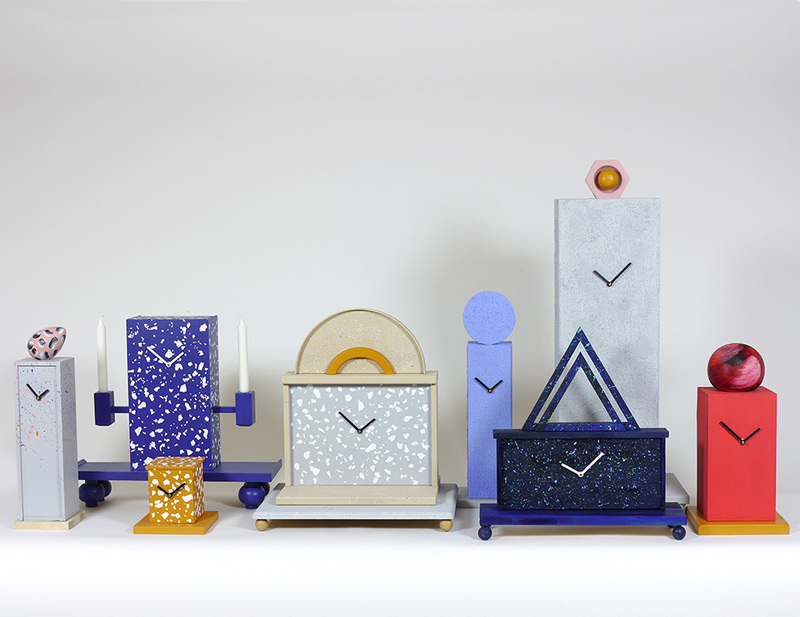 Omkompositioner Collection by Jenny Nordberg // The 1980s Memphis design revival was spotted at this year’s Milan design week – Swedish designer series of clocks created from blocky geometric forms and patterned with speckles, from her ‘Omkompositioner’ collection. So Sottsass at Darkroom London // Crazy colours, clashing patterns, geometric shapes on shapes — it all came rushing back in homage to Ettore and his crew, a fact which the intrepid duo behind London store Darkroom chose to acknowledge with the debut of their So Sottsass collection at last year’s London Design Festival. 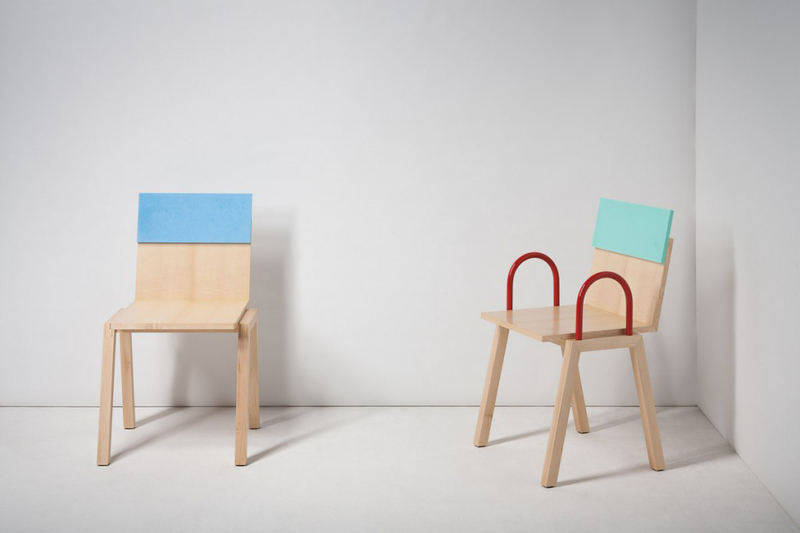 ‘Mish Mash’ chair and armchair by Daniel · Emma. 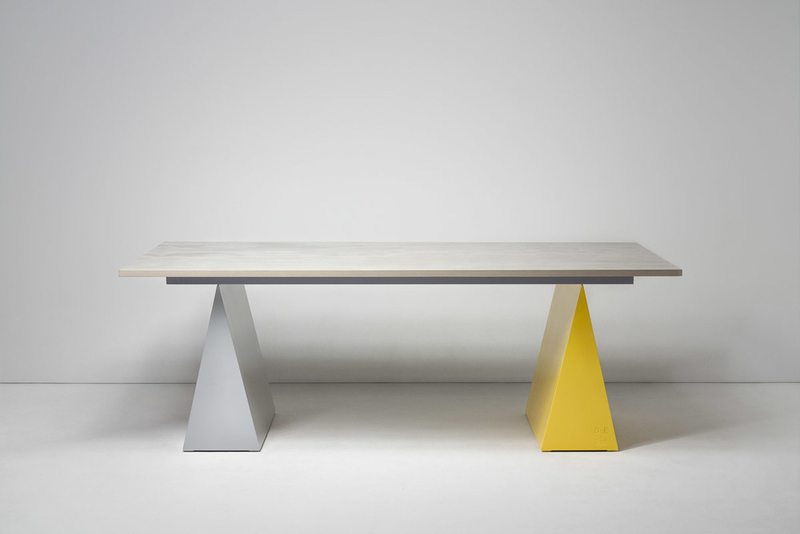 Pick ‘n’ Mix table & bench by Tait & Daniel · Emma. 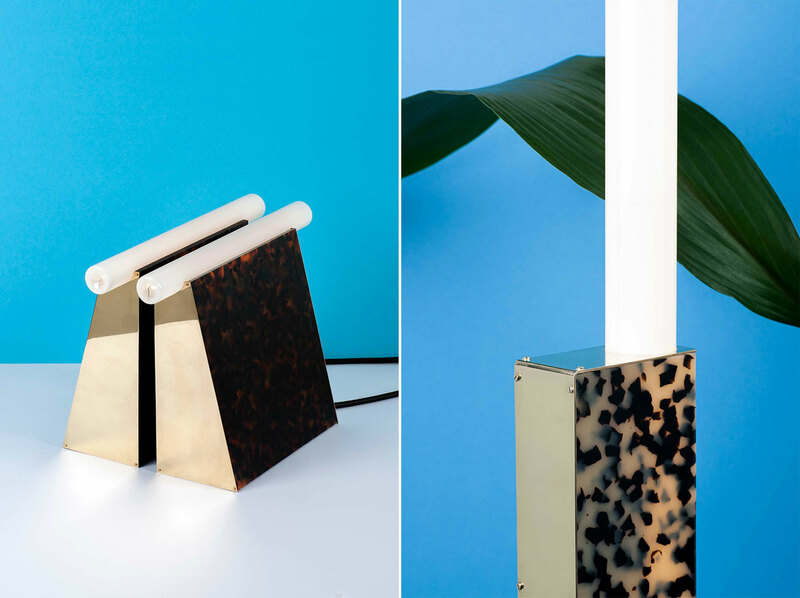 Products by DANIEL EMMA // Daniel To and Emma Aiston established the design studio in 2008, to enable them to express their thoughts through Industrial Design. 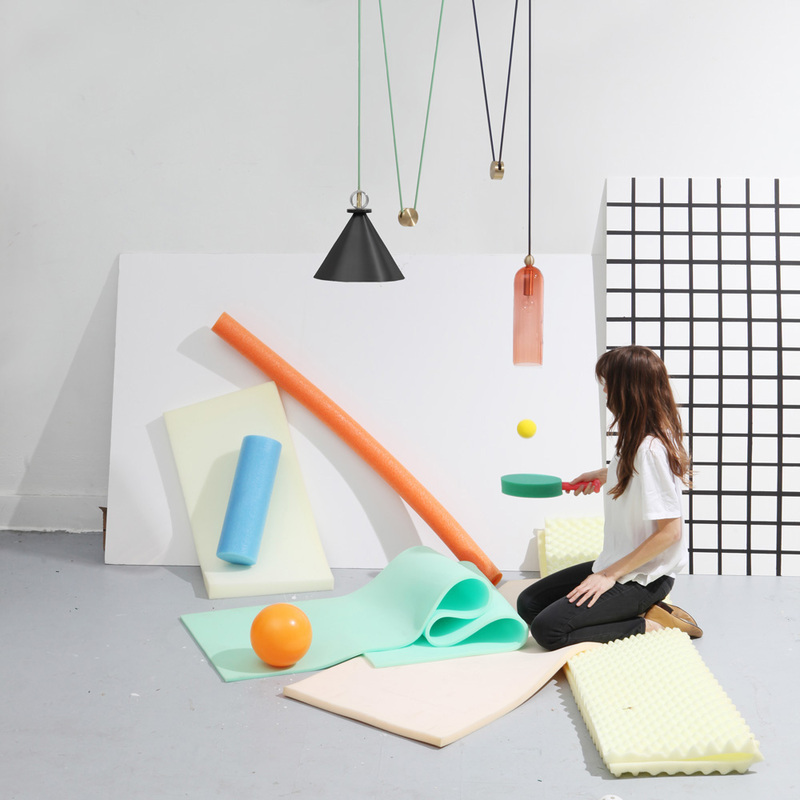 The studio works on a large variety of projects, ranging from desk objects to installations. 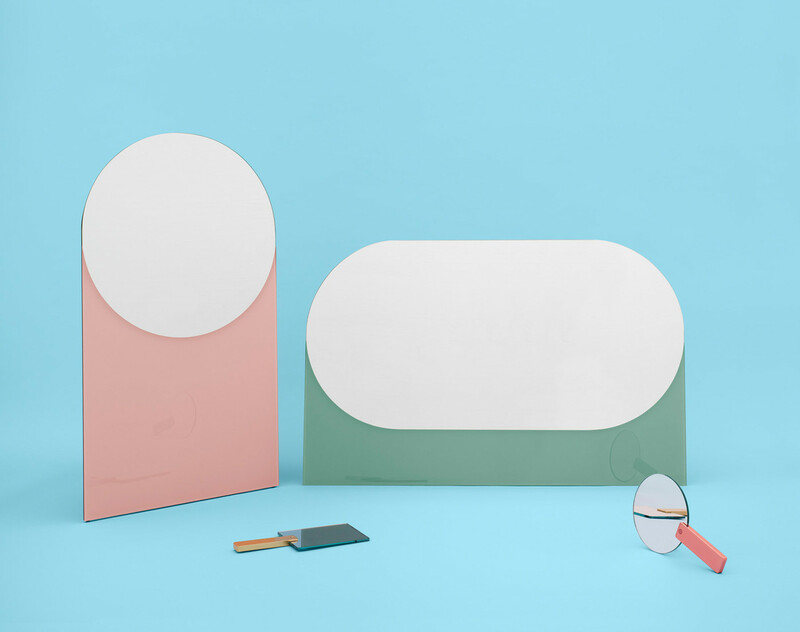 Looking to create the unexpected from simple objects using simple forms, drawing influence and insight from the diverse culture that Australia presents them with. 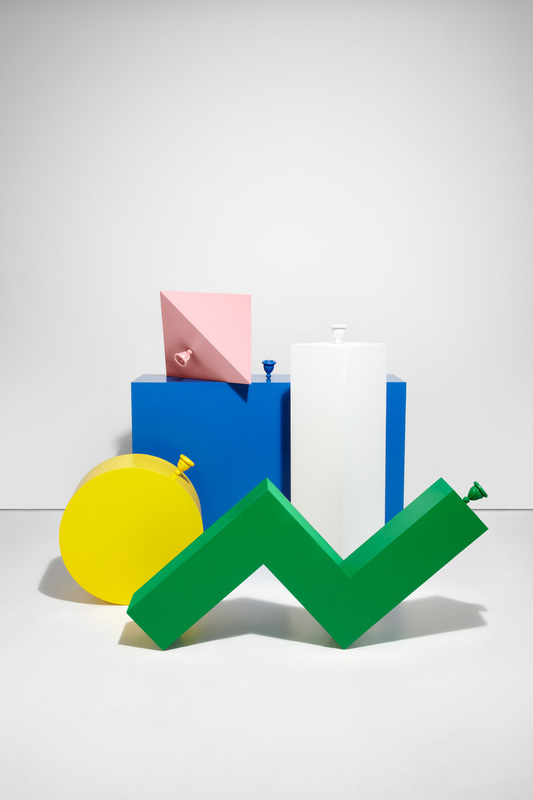 ‘Pedestal’ tables by Vera & Kyte // Vera Kleppe and Åshild Kyte, the Norwegian design duo behind , love to experiment with materials and colour. 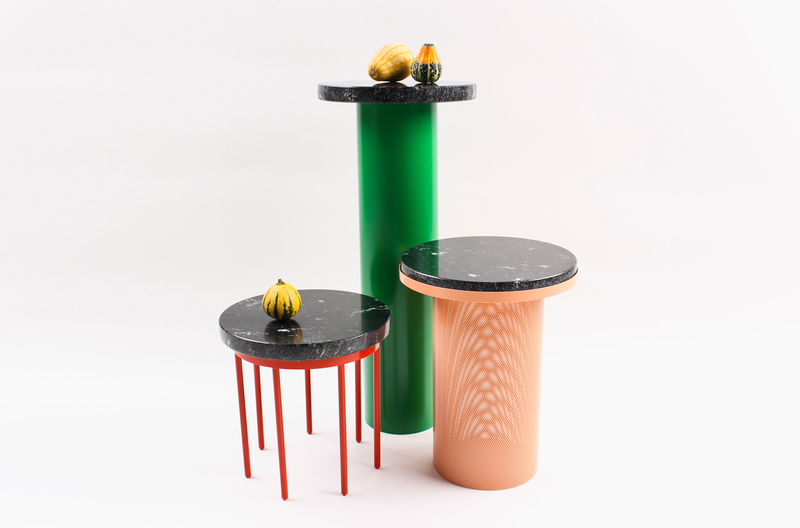 Their latest collection, ‘Pedestal’, features three brightly hued tables made from granite and steel. 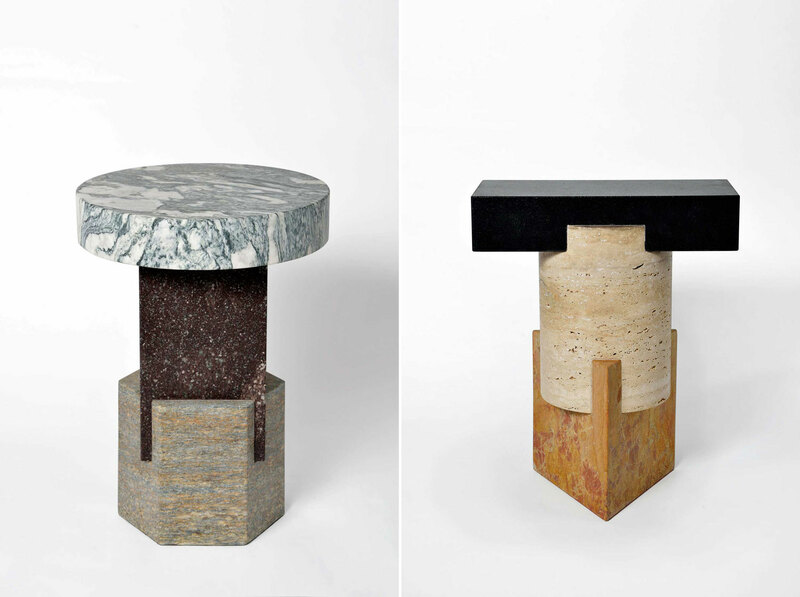 Exhibited at last years Salone Satellite in Milan, the Pedestal collection combines polished black granite tops with lacquered steel bases to create a range of side tables of different heights and shapes. 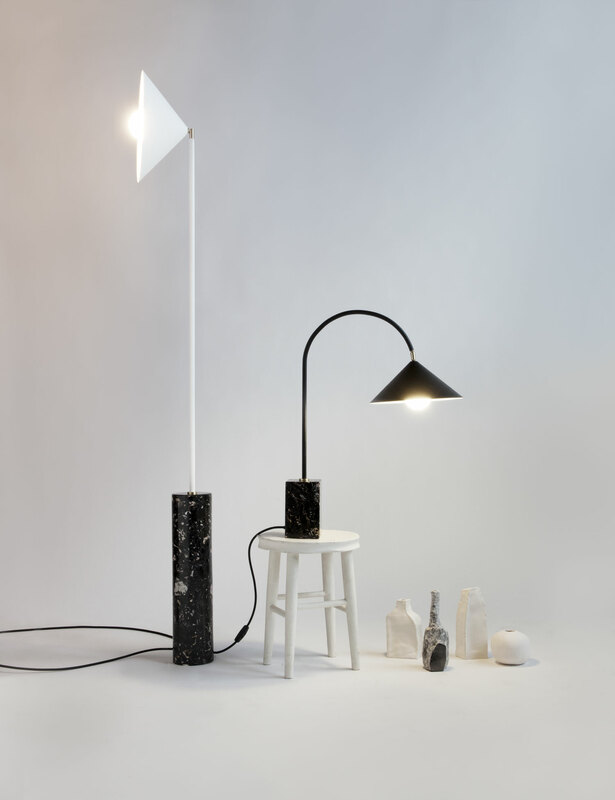 Product Range by Moving Mountains // Brooklyn studio Moving Mountains have released several pieces, including the sculptural and functional ‘Hi-Lo Shelving’, a wooden ‘A-Framed Mirror’ painted bright orange on the back, and a pair of lamps with engineered marble bases and slender powder-coated steel stems. 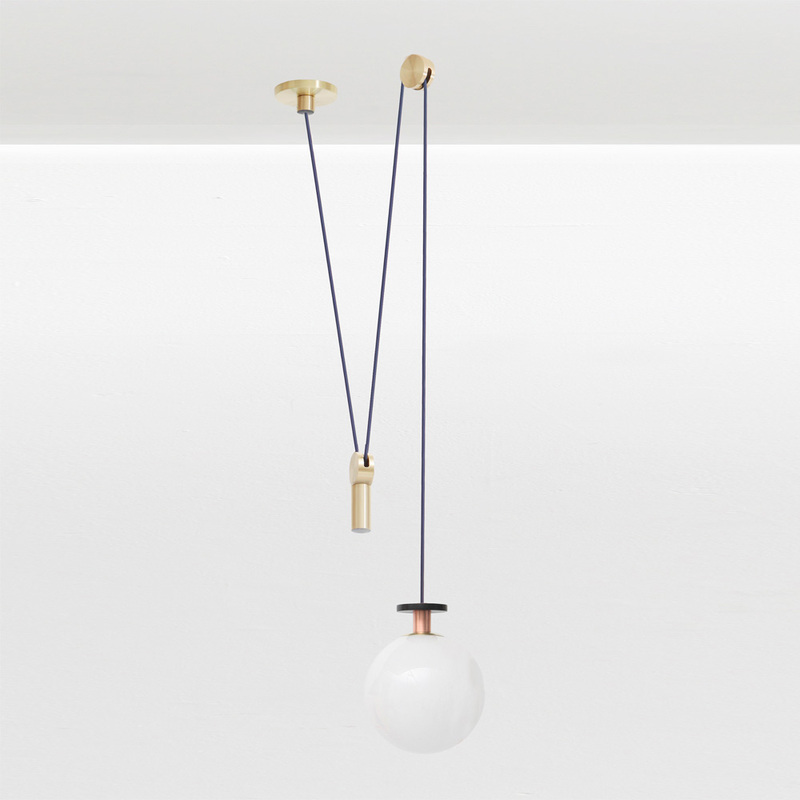 The 2 lamps have pivoting conical shades, with their stands branching out in different directions, all composed of powdercoated steel accented by polished brass. Related Post // Moving Mountains Handmade Furniture & Accessories. Neo Laminati Collection by Kelly Behun // ‘Neo Laminati’ collection of furnishings features bold patterns and bright colours. 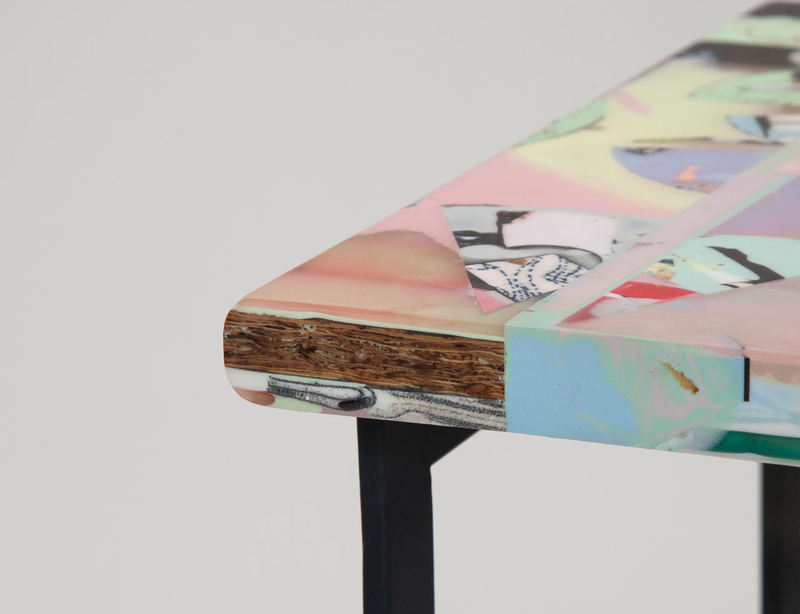 Using laminate materials, the statement pieces feature atypical shapes and graphics not often used in the furniture world. The new pieces evolved from a partnership with local craftspeople in Marrakech to create unique woven rugs made from found remnants of fabric. 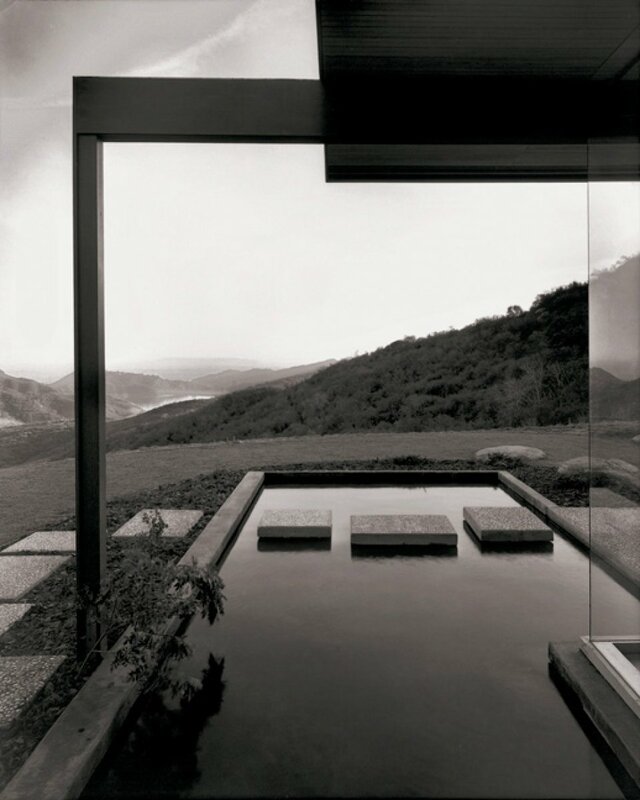 Images © Epiforma & Luís Espinheira. 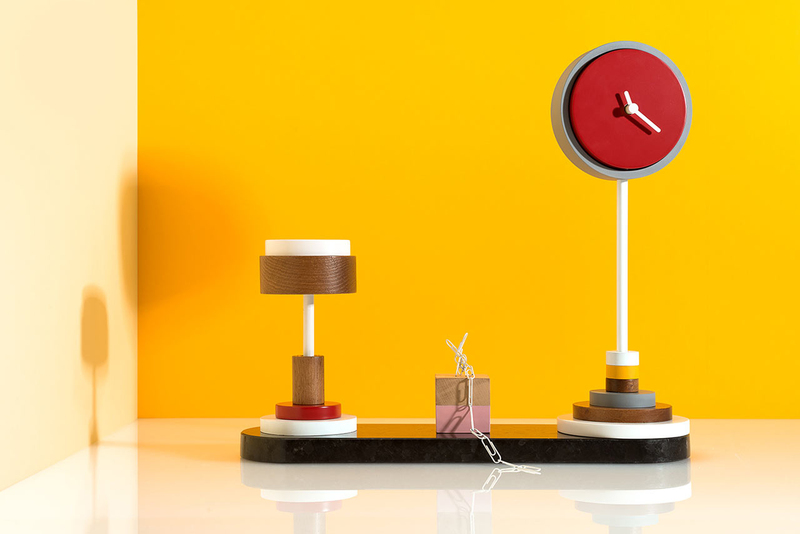 Meanwhile Curiosities: A Conceptual Representation of Time // Portuguese design studio designed a project called Meanwhile Curiosities, meant to act as conceptual representations of time. Mixing unexpected materials and fun colours, they explored new structures with distorted details in hopes of showing the connection people develop with objects the more time they spend with them. 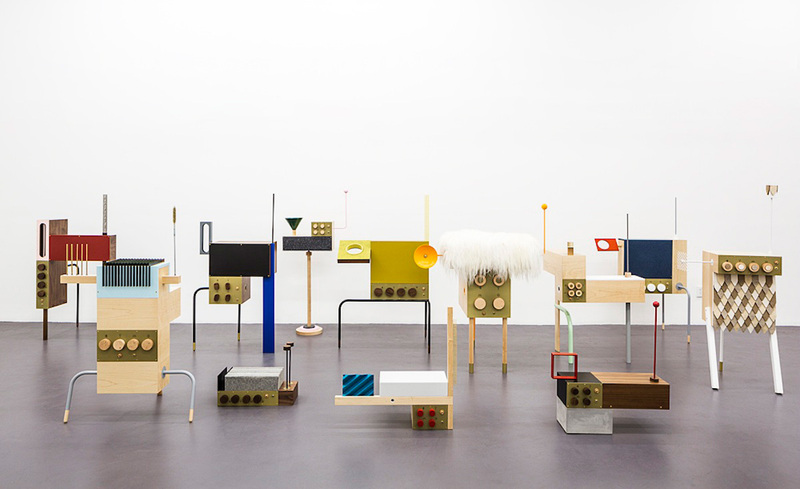 The result is a playful collection of functional and sculptural objects and furniture that can be used and played with. Balloon Geometry by Catherine Losing & Gemma Tickle // London based shop and incubator, Darkroom commissioned set designer and photographer to takeover their new window and create an installation under the concept of ‘Pop.’ ‘Playing with the expectation of how objects behave, you can create new versions of the everyday. 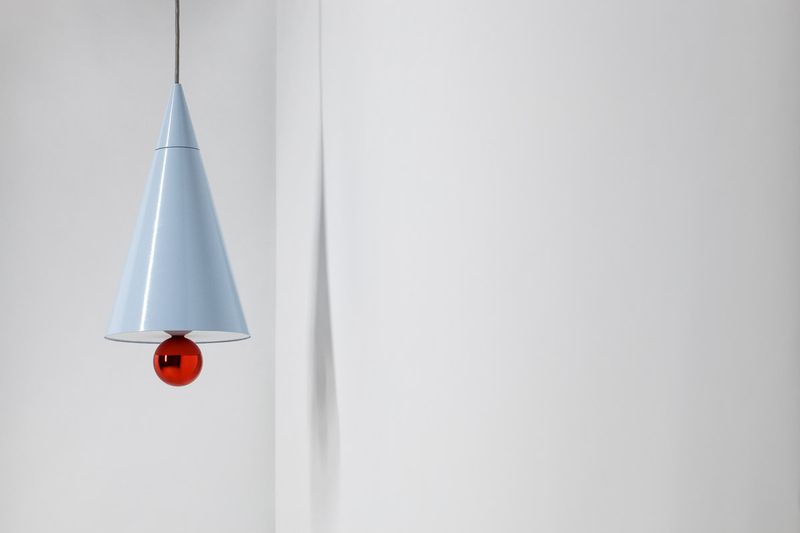 ‘POP’ is a celebration of this, taking the essence of an object and reforming it to an impossibility’. Optical Trickery in collaboration with photographer Jess Bonham. 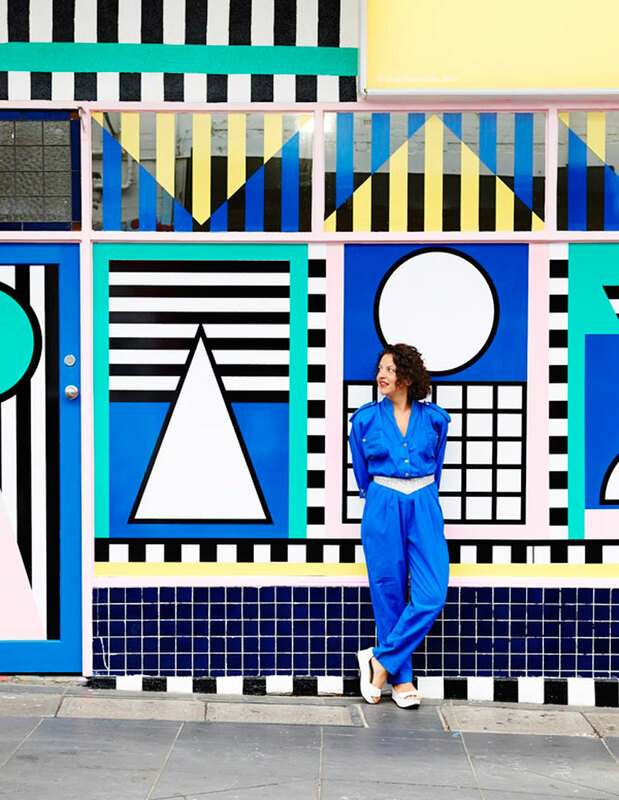 Camille Walala outside her mural at Third Drawer Down on Greville St, Prahran. Photo by Eve Wilson. 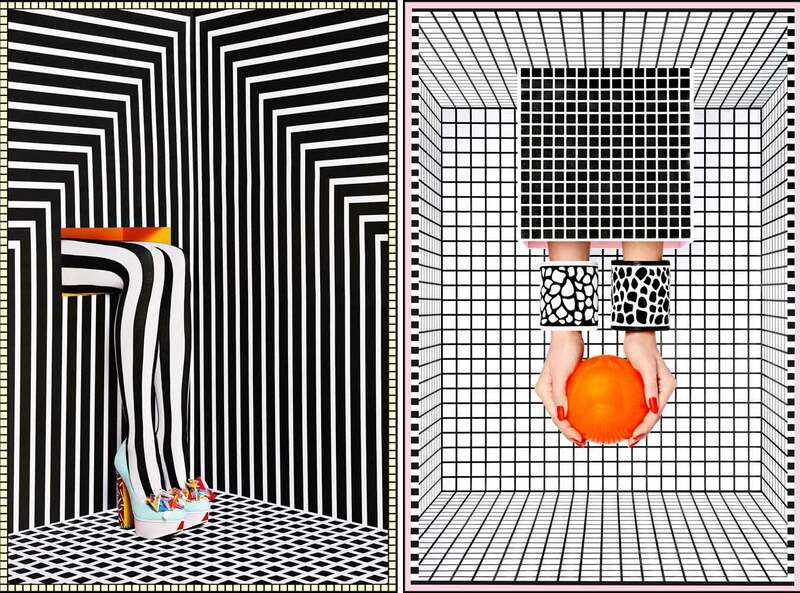 ‘Optical Trickery’ set design by Camille Walala in collaboration with Jess Bonham // is a purveyor of powerfully positive digital print. Recent work has seen her progressing from her popular textile based range to include Art Direction, Interior Design and a continued love affair with popup restaurants, where her love for food and design are brought to life. She works a lot on the colours and the shapes. At the moment her favourite colour combination is Black/White and bright yellow or pastel pink, grey and blue. 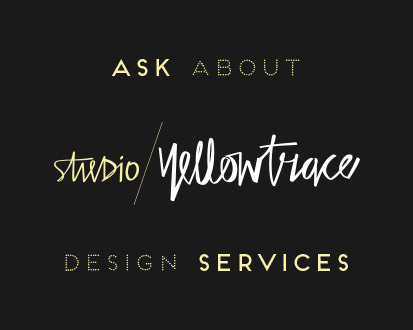 She describes her work with two words – “bright and bold”. Young Mič Styling hair salon by Slovenian architects Kitsch-Nitsch // , the leading salon brand in Slovenia launched a new brand of salons called – deciding to target the younger demographic, with the help of design studio . The result is a vomit of 80s references with a surprisingly ok result. I think. Installation art by Dominique Petrin // Dominique Pétrin is a multidisciplinary Canadian artist based in Montreal. Her unwavering commitment to extraordinary hyper-colour excites me to no end. Squeal! 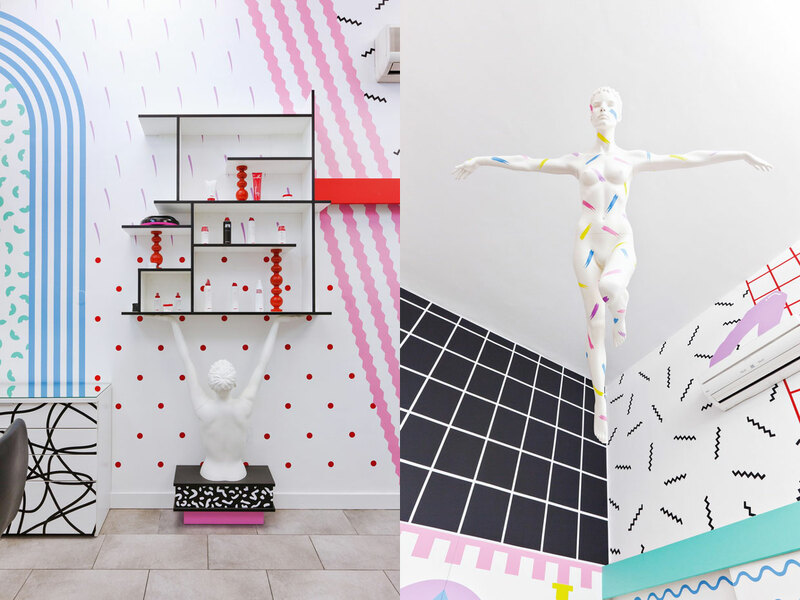 In her more-is-more approach to mixing clashing patterns, graphics and iconography, Dominique creates trippy and exciting installations that converge the world of art, graphic design and interiors. 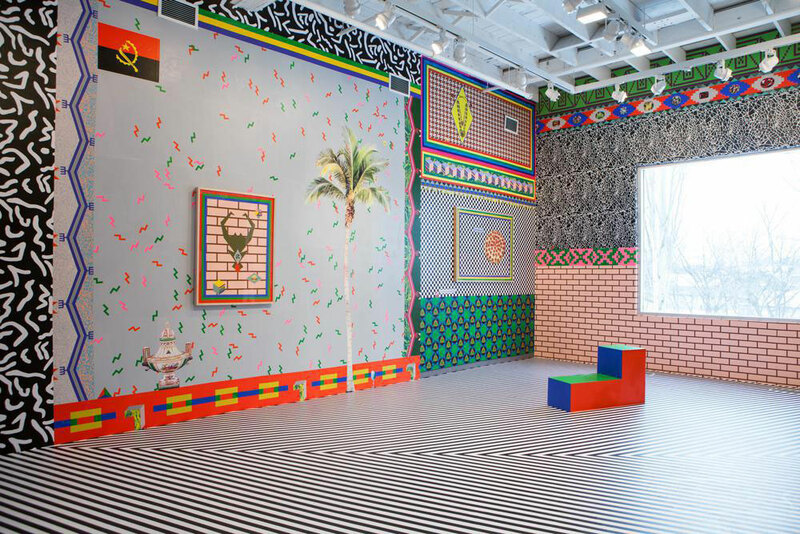 Relates Post: Dominique Pétrin’s Colourful & Trippy Interior Installations. 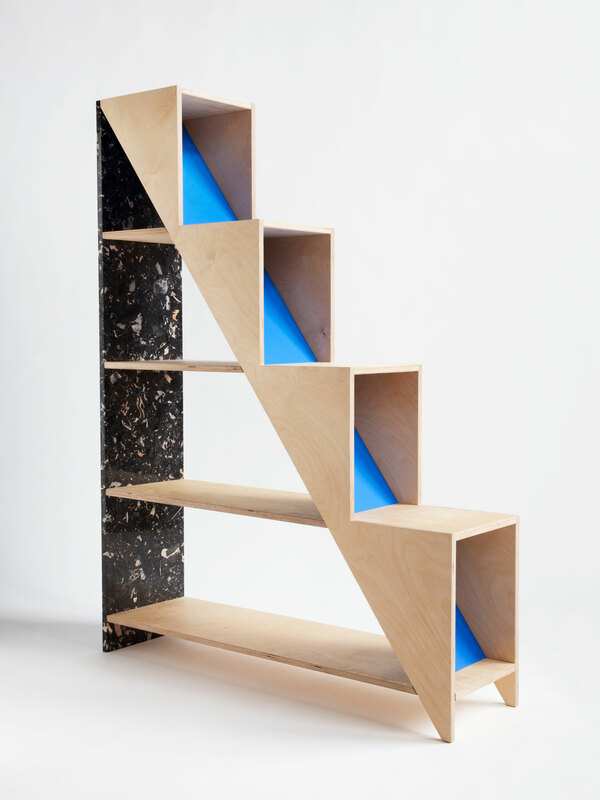 Neolithic Shelving by Page 33 // This modular shelving system by Sydney-based was inspired by early neolithic era rock sculptures. It can be adapted and configured to suit the environment. 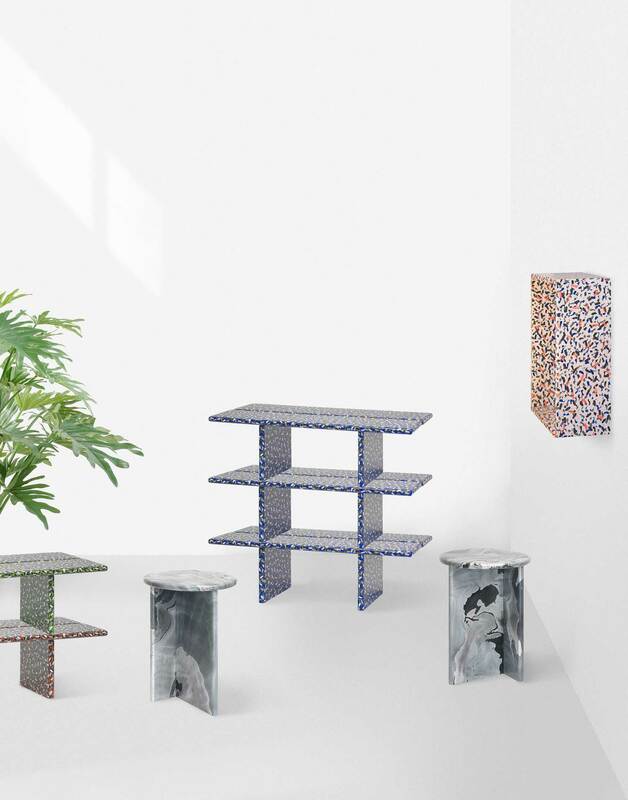 AFFORDANCES by Jonathan Zawada // series are an open edition of side-tables based on essential forms and simplified construction. Each is a combination of three pieces of marble or granite (and the occasional piece of synthetic stone), are flat packed and require no fixtures to assemble. 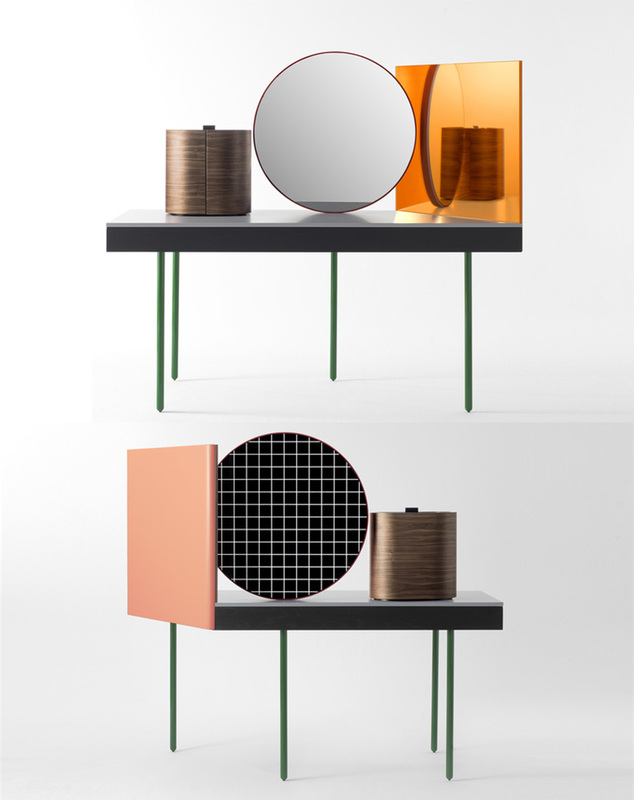 Chandlo dressing table by Doshi Levien for BD Barcelona // “Chandlo” means moon shape and also Bindi – the coloured dot worn by Indian women on the forehead, to which the large rimmed mirror makes reference as the main lead in this piece. The seemingly abstract composition of the mirrors, cabinet and surface is based on the gestures and daily ritual of dressing up and grooming oneself. 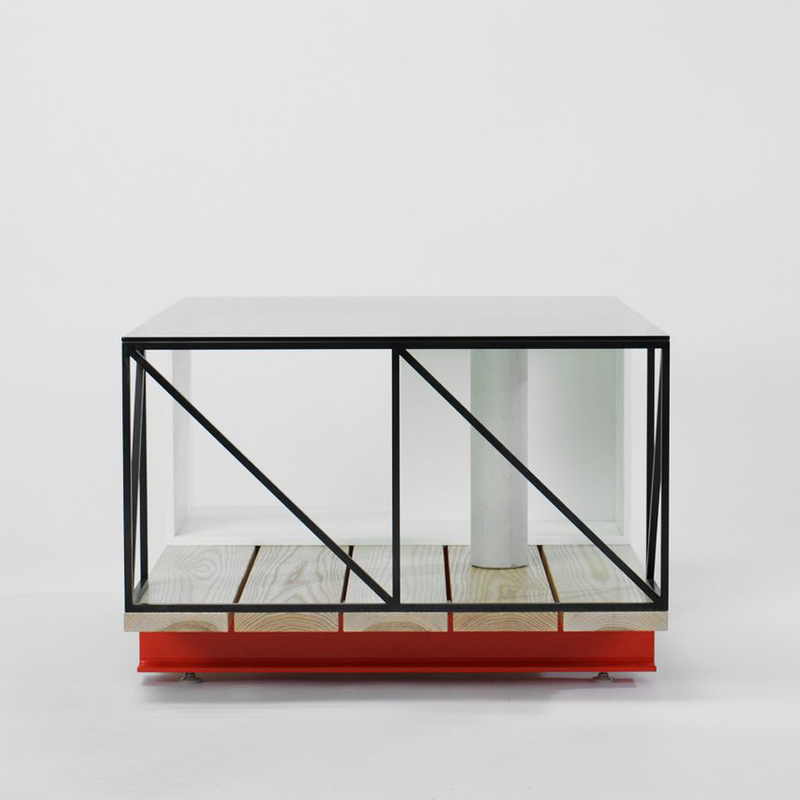 The table was designed especially for the installation by Doshi Levien at IMM Cologne 2012 that explored Jonathan and Nipa’s vision of a perfect house. Odd Pears with Phebe Schmidt // teamed up with Melbourne-based photography extraordiniare , to shoot their newest range. 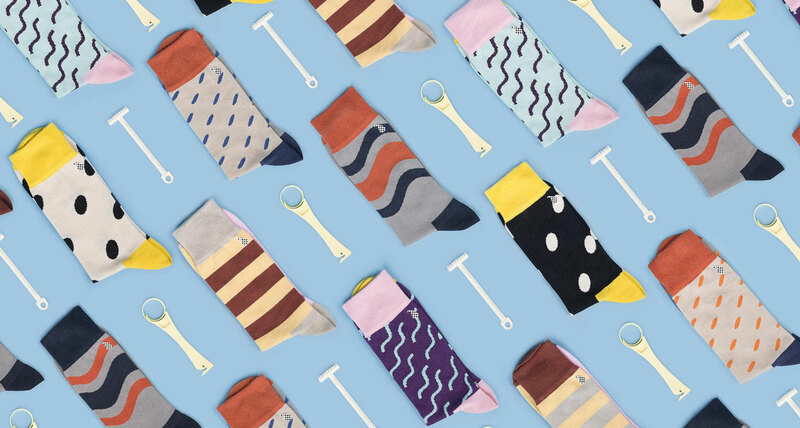 The images draw the viewer in with the bright socks and curious props, but on second glance they realise that something is not quite right – drawing attention to the perfection of the socks and the imperfection of the accompanying subject. 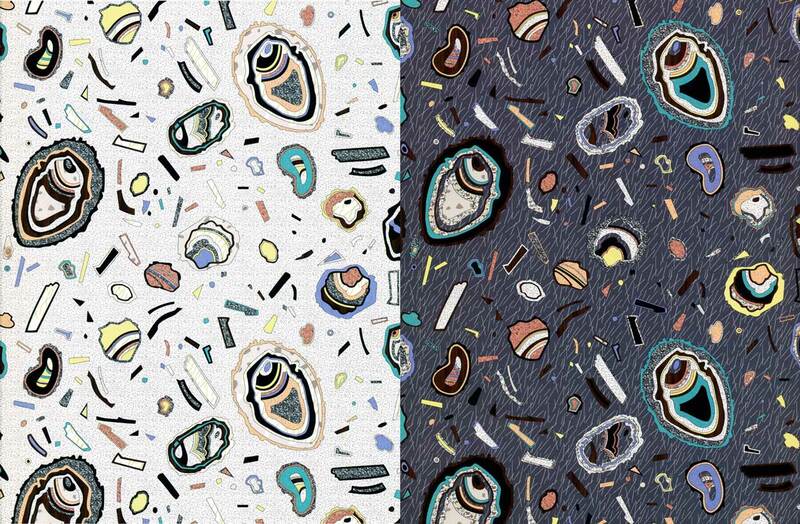 Soft Rock repeat by Bethan Laura Wood // Soft Rock – repeat from the series ‘super fake’ is a digital repeat fabric. The repeat, was originally a file used to choose colour ways for the Hard Rock furniture. became fascinated with making a fake of a fake, re-interpretation interpretation the laminates, which often are interpretations themselves. The pattern is inspired by the patternations found in rocks and minerals. Also available as Rolled rock digitally printed wallpaper. 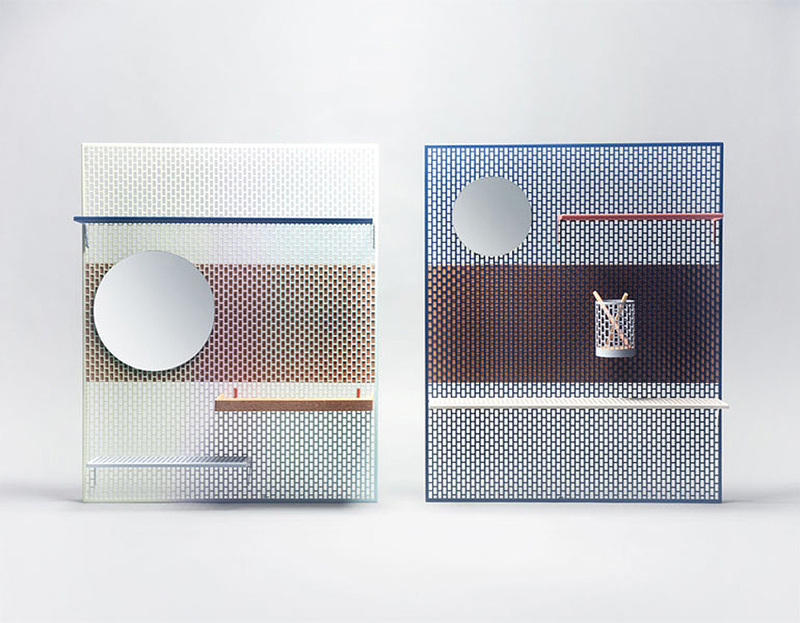 FLOCONS Collection by Ferreol Babin // This collection of shelves and mirrors by are covered with thousands of small colourful dots randomly made one by one with a brush. Due to a random process of painting that creates marble textures, standard boards of beech wood become unique. 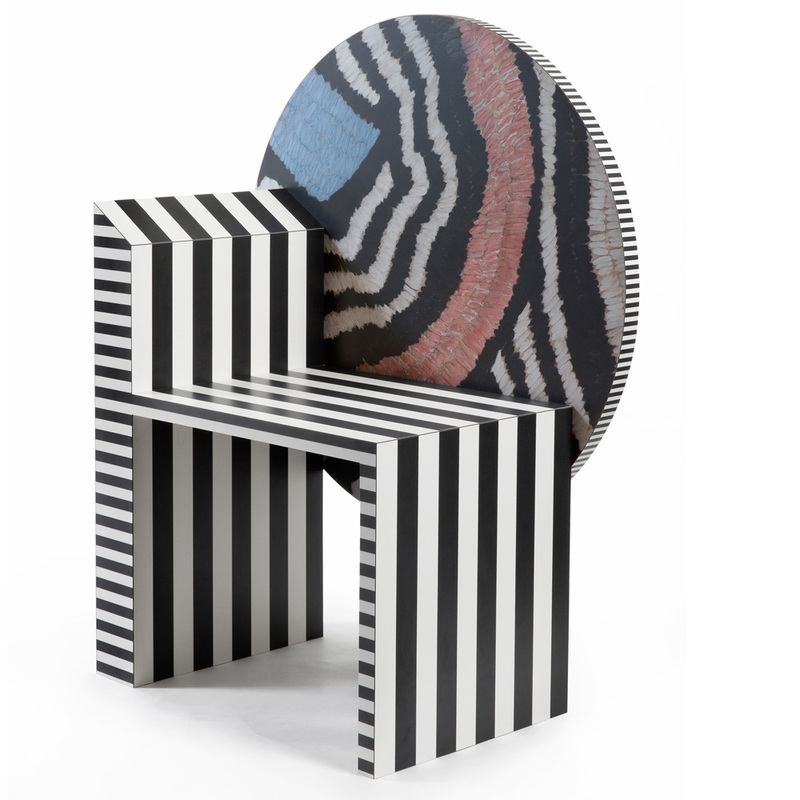 They are assembled to form stools and coffee tables that mix elementary shapes and functions with surprising patterns and colours, creating vibrant and eye-catching textures. The Odd Harmonics by Francois Chambard // No keys, strings, steel or horsehair. To play this strange musical instrument called ‘theremin’, there’s no need for any physical at all. 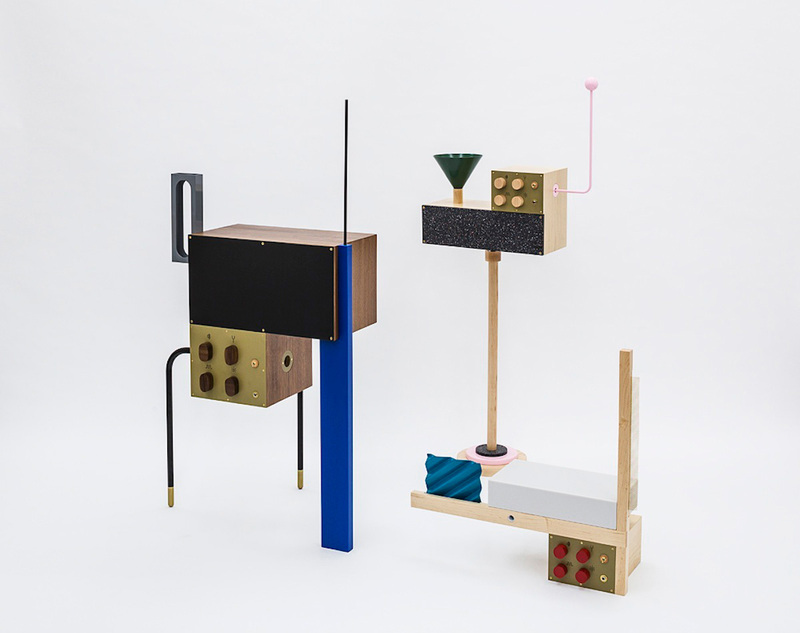 Its shape is pretty ordinary – a box and an antenna – re-stylised by into 12 models somewhere between sculptures, pieces of furniture and instruments. 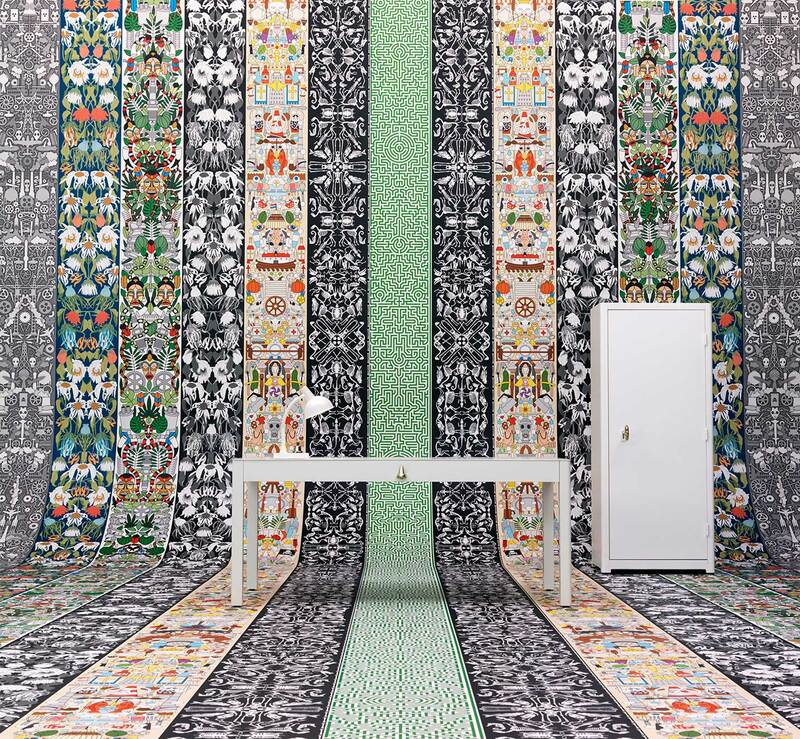 ‘Pinorama’ by Inga Sempe for HAY. ‘Shapes’ by Inga Sempe for HAY. 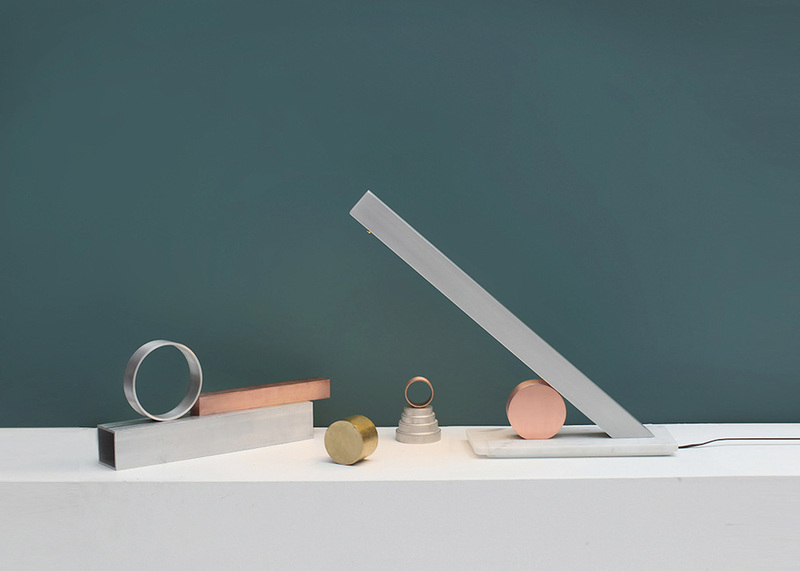 Accessories designed by Inga Sempe for HAY // French designer created a range of accessories for Danish brand in the form of shelves, cylinders and mirrors. 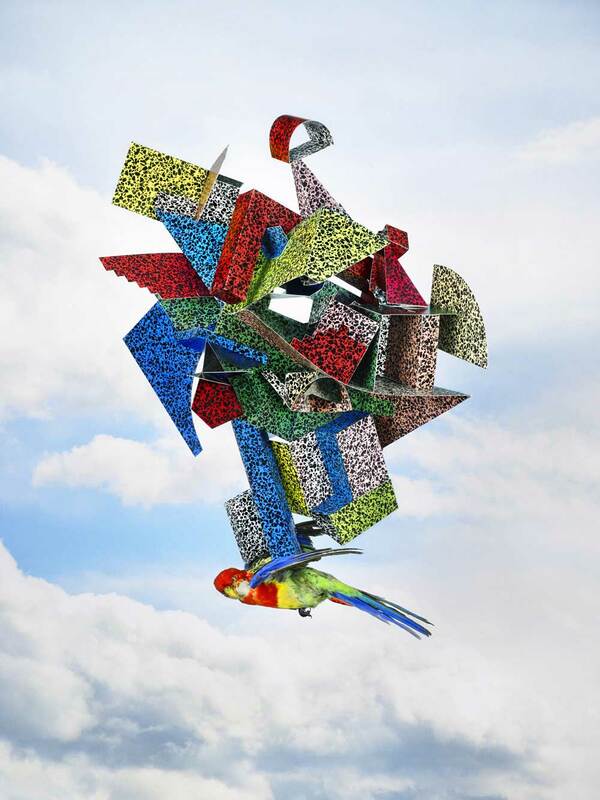 Optical Illustration Design by Rosie Li // There is a definite theme with optical illusions to work. 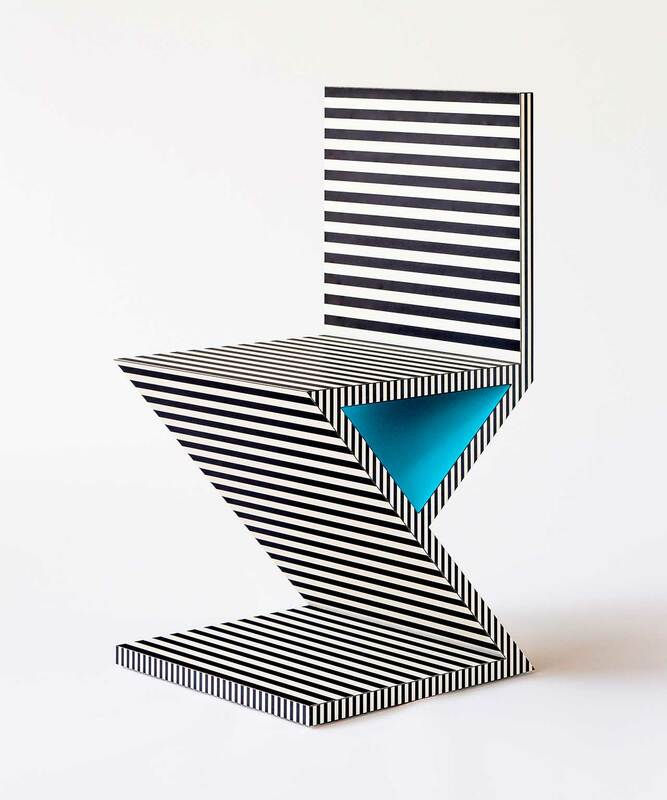 The ‘Clash Chair’ is inspired by the (hypothetical) collision of two geometric bodies and the discordant nature of that crash. 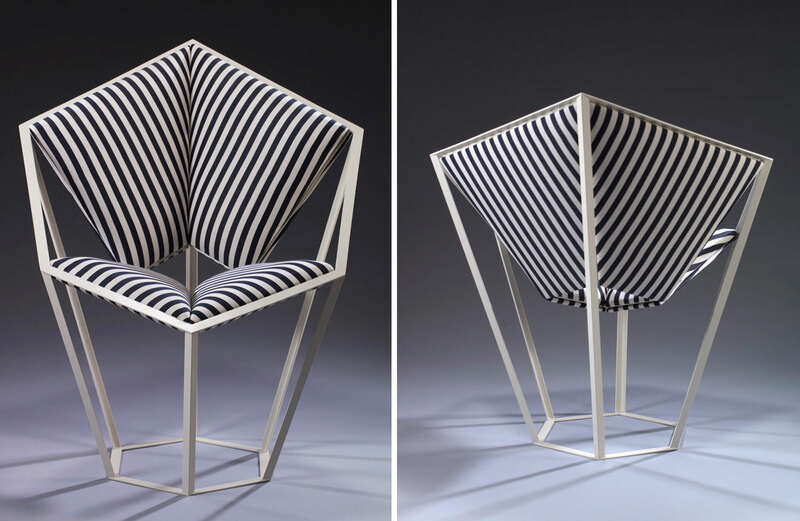 Though the chevrons create visual tension, sitting in this ergonomically minded chair instantly puts the viewer at ease. 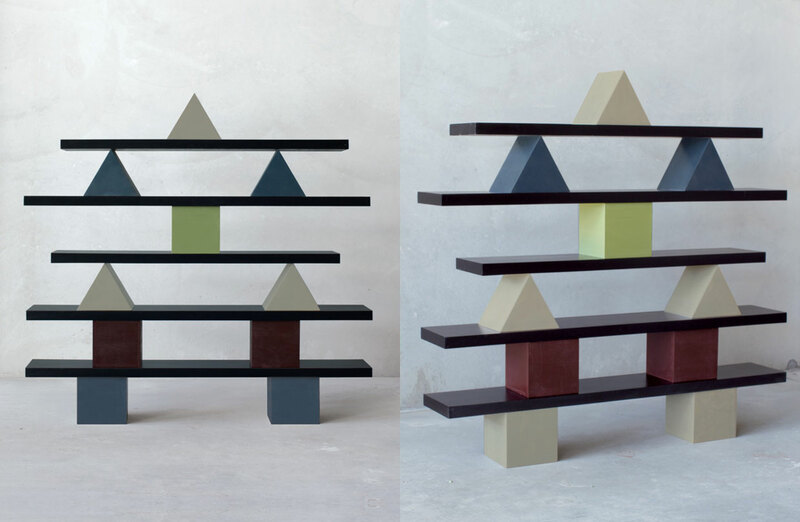 Range Life by for // Range Life is a coffee table inspired by an unlikely combination of sources. This piece creates its own as-yet-undefined genre, bringing grand forms normally found in exteriors into the comfort of your living space. Kapital Stool/ Side Table by Oeuffice // With an undeniable focus on creating innovative objects, Italian design studio have launched their collection titled KAPTIAL. 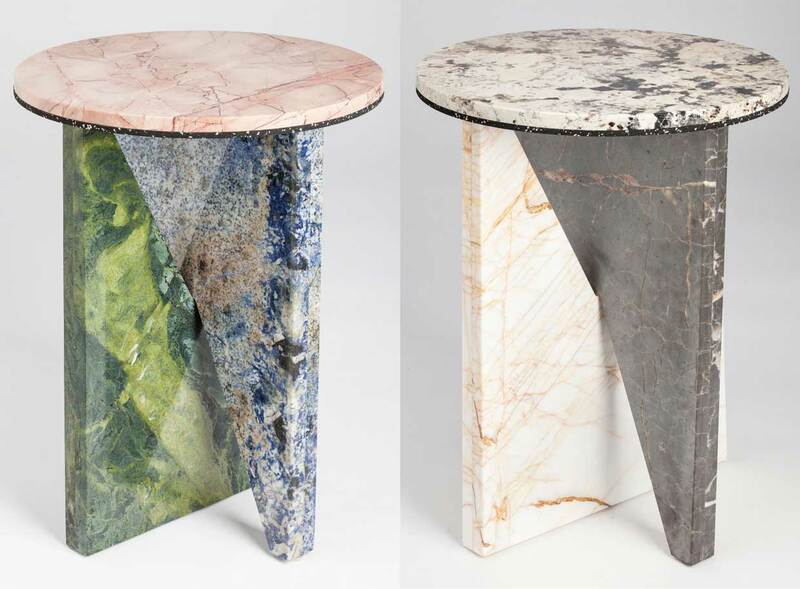 Keeping in line with the geometric form of their previous collections, KAPITAL is a limited edition of side tables and stools made out of stone and marble. 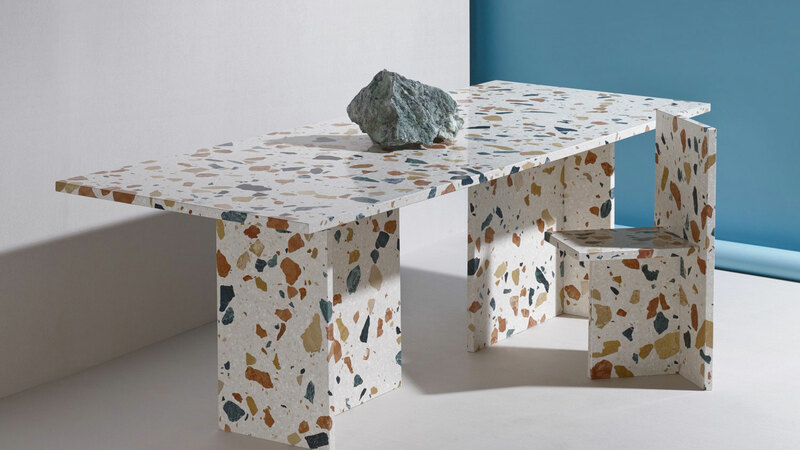 Marmoreal by Max Lamb // British designer developed a multicoloured engineered marble for , which was used to build furniture that appears to merge with walls of the same material for an installation in Milan last year. 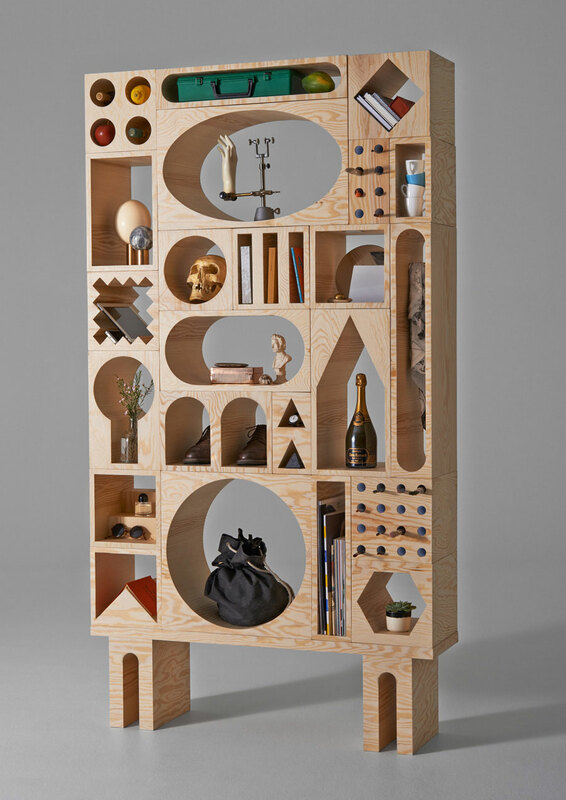 ROOM Collection by Erik Olovsson & Kyuhyung Cho // ROOM Collection is a modular furniture system that is made up of 25 stackable blocks with geometric voids and a low table that let you compose your own, unique storage unit. Designed by and , the collection was inspired by architecture and a desire to create furniture that acts as rooms for objects. Acapulco Lamps by & // The Acapulco lamps are an homage to the glass makers’ gesture of comparing different tortoise shell patterns at light, which is the moment when the material reveals all its splendour. Studio Job Wallpaper for NLXL // founders Job Smeets and Nynke Tynagel raided their archive and used existing drawings, icons, images and patterns to create unique nine-metre running compositions without any repetition, for the Archives wallpaper collection for , which debuted in Milan last year. Modern Chair Colour from The Sorry Collection by Tessa Koot. The Sorry Collection by Tessa Koot // Applying new materials and techniques to a rough framework of modernist aesthetics, ‘The Sorry Collection’ revels in the potential of mistakes and mishaps. Here the chaos and disorder Mein Führer hoped would turn his public against the modernists is celebrated, the freedom of risk-taking critical in the success of another headstrong series of objects. Resin Stool by Chen Chen & Kai Williams // NYC-based studio create these incredible resin stools. Black powder-coated steel legs are topped with a urethane resin top in their trademark mixed material style, reminiscent of the weird chopped cold cut coasters released a while back. A modern take on a marble effect. Left: mm1 Arm Chair. Right: BIS Lounge Chair. mm1 Armchair & BIS Lounge Chair by // Debt collection shown at 2014, Mario Milana’s punchy geometric MM1 armchair has a pivoting backrest and casters on its back feet. 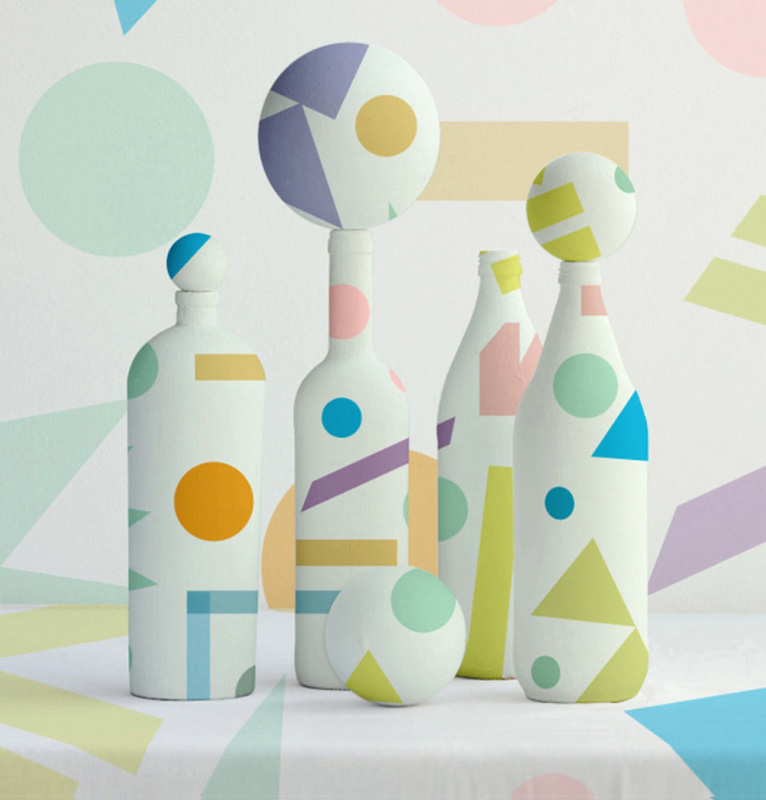 Hello Pattern Collection by Judy Kaufmann // Barcelona-based illustrator launched a collection of new patterns on her site, ‘Hello Pattern’. The series features a variety of colourful, geometric, and organic patterns that can be used on paper, fabric, or even your walls. House of Cards by Terrazzo Project // During last year’s Milan Design Week, presented an innovative installation showcasing the new extra-light structural TP-PANELS. The exhibition, entitled ‘House of Cards’ features a seemingly fragile oversized house of cards made with colourful honeycomb-reinforced terrazzo TP-PANELS. Memphis Throw by Conrad Crespin // work is characterised by the use of abstract references on which he masterfully applies colour to create powerfully graphic compositions. 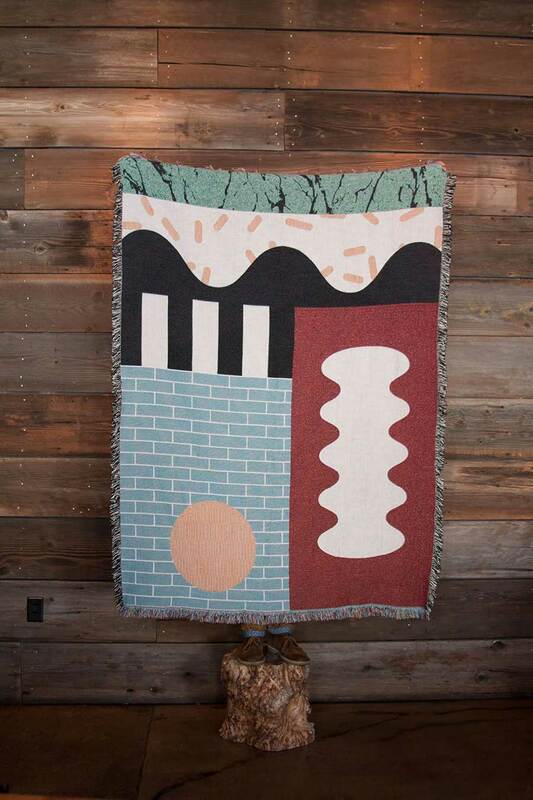 ‘Memphis Throw’ is his latest collection of blankets, inspired by the aesthetic resources of the Memphis movement. Backstage Wardrobe System by Antonio Citterio for B&B Italia. Joint Exhibition by Anna & John Ancher at Quadrant Gallery Melbourne. 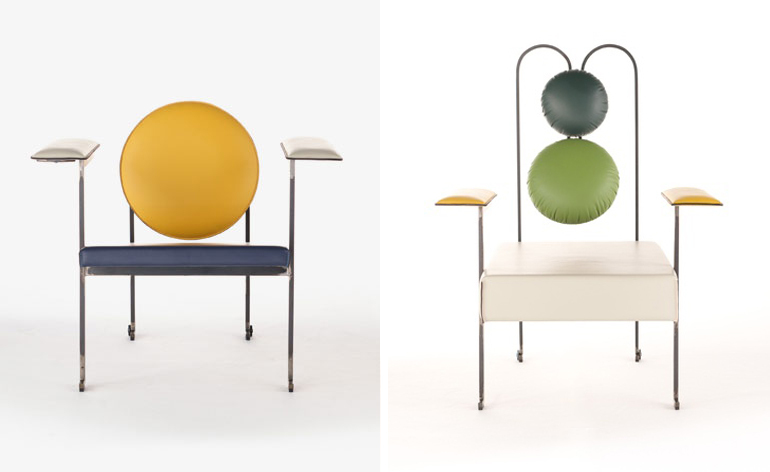 Well done article on new Memphis inspiration in modern design. Congrats! Amazing. Thank you Memphis Milano! Killer read. Thank you Dana & Tourismandhotels!